Who invented the Violin? The name of the person credited with inventing the Violin is Andrea Amati (1505 - 1577). Andrea Amati is not only famous as the Italian inventor of the Violin but also as a musician and maker of musical instruments. When was the Violin invented? Andrea Amati invented the Violin in 1542, during the Renaissance period of inventions (1350 to 1700). Definition of the Violin: The Violin is defined as bowed stringed instrument that has four strings and a hollow body and an unfretted fingerboard and is played with a bow or by plucking the strings with the fingers. The violin is held nearly horizontal by the musician's arm with the lower part supported against the collarbone or shoulder. Fact 1: Who invented the Violin? 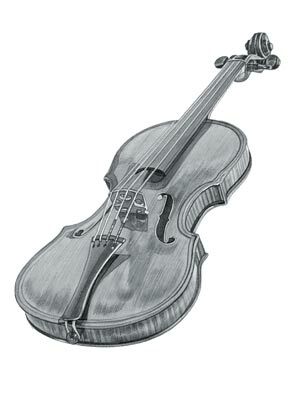 The Violin was invented by Andrea Amati in 1542 during the Renaissance era of inventions (1350 to 1700). Fact 2: Who invented the Violin? The word 'violin' dates from the 1550s and derives from the Italian word 'violino', a diminutive of viol. All members of the viol family of musical instruments are played upright, unlike the violin, which is held under the chin. Fact 3: Who invented the Violin? Prior to its invention in 1542, the origins of the violin can be traced to the fiddle, the rebec and the lira da braccio. Fact 5: Who invented the Violin? The rebec was a pear-shaped, 3 stringed musical instrument, a type of bowed medieval fiddle that emerged during the 1200's. The lira da braccio was the immediate precursor of the violin that emerged in the Renaissance era in the 1400's. Fact 6: Who invented the Violin? Giovan Giacoba dalla Corna (1485 - 1560) and Zanetto Micheli (c. 1489 – after 1560) were both instrument makers and master of string instruments of the "Brescian school" and have occasionally been credited with the invention of the violin. Fact 7: Who invented the Violin? Both Giovan Giacoba dalla Corna and Zanetto Micheli were experts in the smaller, medieval version of the violin, the lira da braccio (meaning viol for the arm). The Brescian School became a famous center of Italian violin makers but it is clear from dates of events that Andrea Amati of the Cremona school of violin makers perfected the violin. Fact 8: Who invented the Violin? The inventor of the Violin, Andrea Amati, was born on 1505 in Cremona, Italy and died on December 26, 1577. Fact 9: Who invented the Violin? The early years of Andrea Amati were spent in Cremona, Italy where he was raised by his highly respected and prosperous family. Andrea Amati was an excellent young musician and extremely well educated in Renaissance science and mathematics. Fact 10: Who invented the Violin? Following his education it is believed that Andrea Amati learned about his family's prosperous merchant trade and travelled to Venice, a center of the amber trade. However, Andrea Amati was not interested in the life of a merchant and undertook training to became a luthier, a maker of stringed instruments. Fact 11: Who invented the Violin? Andrea Amati is believed to have studied the art of making musical instruments in Venice with the esteemed luthier Giovanni Leonardo da Martinengo who specialized in making lutes. (The word "luthier" comes from the French word luth, which means lute). Andrea Amati believed his choice of a career as a luthier would lead him to fame and glory - and he would be proved right. Fact 12: Who invented the Violin? The royal courts during the Renaissance era were great patrons of music and their collections of musical instruments were highly valued. Particular interest was always taken of the invention or development of new musical instruments and rival courts of different European countries vied with each other over their collections of musical instruments. Fact 13: Who invented the Violin? Andrea Amati studied hard whilst working in the shop of his master learning the delicate art of the luthier discovering the secrets and science behind making good-sounding stringed instruments. He acquired the knowledge of the acoustical and structural attributes of air chambers, how to select a good piece of wood, how to select the right strings and how the application of varnishes on the wood might effect the sound of a musical instrument. Fact 14: Who invented the Violin? His knowledge and connections with the amber trade helped Andrea Amati in his work as a luthier. The dark amber-based oil varnishes were applied to musical instruments, imparting a rich warm transparent golden brown tone. Fact 15: Who invented the Violin? Andrea Amati invented the Violin in 1542 which he evolved from the medieval version of the violin, the lira da braccio. He used his knowledge of the laws of acoustics to create the unique, sweet, melodic tone of the violin. Fact 16: Who invented the Violin? Andrea Amati designed his new musical instrument with care and accuracy using maple and spruce to create the body of the violin, paying close attention to the curvature of the arched top and back of the violin. The circular sound hole was accurately designed so that the hollow wooden resonance chambers amplified the sound of the strings, and at the same time allowed the sound to escape. Fact 17: Who invented the Violin? The critical task of positioning the sound post to ensure sound quality and the loudness of the instrument. The bass bar that propped up the arching was asymmetrically placed to ensure the tuning and balancing of the plate. Andrea Amati also realized that the final varnish to the violin affected the sound of the instrument and that none of the elements used in making the violin could be moved for fear of disturbing the delicate equilibrium between the wood and air. Fact 18: Who invented the Violin? In about 1550 Andrea Amati founded the Cremona school of violin makers. Fact 19: Who invented the Violin? His invention of the violin brought Andrea Amati great acclaim and as his reputation as an expert luthier increased, Andrea Amati received commissions from both the Italian and French courts. Fact 20: Who invented the Violin? King Charles IX of France (1550 - 1574) began his reign in 1560 and in 1564 commissioned Andrea Amati to make 38 musical instruments consisting of 12 large and 12 small violins, 6 violas and 6 basses. Fact 21: Who invented the Violin? These beautiful musical instruments were all richly painted and gilded with the coat of arms of King Charles IX. The royal collection of the "24 Violins of the King," in France, symbolized the increased social prestige of Charles IX. Fact 22: Who invented the Violin? Andrea Amati had two sons. His eldest son was Antonio Amati (c.1537–1607), and the younger son was named Girolamo Amati, better known as Hieronymus, (c.1561–1630). Both sons worked with their father in his workshop and produced many violins with labels inside the instrument reading "A&H". Fact 23: Who invented the Violin? Andrea Amati died on December 26, 1577 but his name will always be remembered as the Italiaan inventor of the violin. Fact 24: Who invented the Violin? Andrea Amati left a great legacy as an expert violin maker and this continued with his descendents. Antonio Amati died having no known children, but Hieronymus Amati was the father of Nicolo Amati (1596–1684) who also became an important master luthier. Fact 25: Who invented the Violin? Nicolo Amati had several apprentices of note, including Antonio Stradivari, Andrea Guarneri, Jacob Railich, Giovanni Battista Rogeri, Matthias Klotz, and also Bartolomeo Cristofori who went on to invent the piano c.1709. Fact 26: Who invented the Violin? The most noted student of Nicolo Amati was Antonio Stradivari (1644 - 1737), also known by the Latinized form of his surname, Stradivarius. It is estimated that Stradivarius produced 1,116 instruments of which 960 were violins. Stradivarius violins are deemed to be the finest violins ever made. The price of a Stradivarius is several million U.S. dollars.